Most bones in mammals display a limited capacity for natural large-scale repair. The ribs are a notable exception, yet the source of their remarkable regenerative ability remains unknown. Here, we identify a Sox9-expressing periosteal subpopulation that orchestrates large-scale regeneration of murine rib bones. Deletion of the obligate Hedgehog co-receptor, Smoothened, in Sox9-expressing cells prior to injury results in a near-complete loss of callus formation and rib bone regeneration. In contrast to its role in development, Hedgehog signaling is dispensable for the proliferative expansion of callus cells in response to injury. Instead, Sox9-positive lineage cells require Hh signaling to stimulate neighboring cells to differentiate via an unknown signal into a skeletal cell type with dual chondrocyte/osteoblast properties. This type of callus cell may be critical for bridging large bone injuries. Thus despite contributing to only a subset of callus cells, Sox9-positive progenitors play a major role in orchestrating large-scale bone regeneration. Fractures to major bones often heal slowly or incompletely, especially in older people, and large bone injuries do not repair naturally. By comparison, rib bones show an unusual capacity to regrow and repair themselves even when a large portion is damaged. Previous research suggests that the connective tissue around the ribs helps to support and co-ordinate bone healing. Yet it is currently not clear why ribs have a greater capacity to repair these large injuries compared to other bones. Kuwahara et al. have now examined bone repair by studying how ribs heal in mice. The experiments show that around 6% of the connective tissue cells are critical for large-scale repair. Kuwahara et al. named these cells messenger cells. These cells detect the presence of a signal molecule called Hedgehog (Hh), however, if these cells lose the ability to respond to the Hh molecules, the ribs do not heal properly. Further examination revealed that these messenger cells co-ordinate repair by encouraging other cells to build a special kind of bone-healing tissue with hybrid properties of both cartilage and bone. Further research could now examine how messenger cells co-ordinate healing and if their properties could be adapted to help repair other bones. Ultimately, understanding how messenger cells work may even provide insights into new ways to repair and regenerate other tissues and organs too. Whereas amphibians regenerate large portions of their skeletons after injury or amputation, natural large-scale skeletal repair in mammals is more limited. A notable exception is the rib. Craniofacial surgeons often extract large segments of rib cartilage and bone for autologous repair of skeletal defects in other parts of the body, and in post-operative visits have noted extensive regeneration at the donor rib site (Kawanabe and Nagata, 2006; Munro and Guyuron, 1981; Srour et al., 2015). To better understand the unique regenerative potential of the rib, we have recently developed analogous large-scale rib cartilage and bone regeneration models in the mouse (Srour et al., 2015; Tripuraneni et al., 2015). In most mammalian bones, healing involves the formation of a callus using a mixture of direct ossification and endochondral ossification via a cartilage callus intermediate (Gerstenfeld et al., 2003; Hall, 2014; Marsell and Einhorn, 2011). The identity and regulation of the adult skeletal progenitors that build the callus remain incompletely understood. While markers for a number of different skeletal stem cells have been reported (Balani et al., 2017; Bianco and Robey, 2015; He et al., 2017; Matthews et al., 2014; Park et al., 2012; Ransom et al., 2016; Shi et al., 2017), their relative roles during bone repair are less clear, particularly in cases of large-scale bone regeneration such as in the rib. During skeletal repair, studies have shown that cells from the periosteum, a heterogeneous connective tissue sheath covering the bone, are major contributors to the callus (Colnot, 2009; Duchamp de Lageneste et al., 2018; Murao et al., 2013). Accordingly, we have found that the periosteum is essential for regeneration of the rib bone (Tripuraneni et al., 2015). During normal bone homeostasis, periosteal stem cells generate bone-producing osteoblasts but not cartilage-producing chondrocytes (Roberts et al., 2015). How injury stimulates periosteal stem cells to generate chondrocytes is unclear. Although some fractures can heal in the absence of a cartilage callus, for example when the fracture is rigidly stabilized (Thompson et al., 2002), the formation of a large cartilage callus appears to be required in large-scale bone regeneration. Unfortunately little is known about the specific periosteal progenitor population that drives the formation of the cartilage callus nor the signaling pathways required. Recent studies have used Cre-based lineage tracing experiments to show that cells marked by expression of Gremlin1 (Worthley et al., 2015), Axin2 (Ransom et al., 2016), Gli1 (Shi et al., 2017), Act2a (Matthews et al., 2016), Periostin (Duchamp de Lageneste et al., 2018) and Sox9 (Balani et al., 2017; He et al., 2017) can be found in the periosteum and contribute to the fracture callus during repair. Other than participation, the specific role of any of these progenitor population remains unclear. In this study, we therefore focus on the role of one subpopulation within the periosteum and its specific role in driving callus formation and bone regeneration. As Sox9 has a well-known function in promoting chondrogenesis during embryonic development (Akiyama et al., 2002; Lefebvre et al., 1997), we postulated that Sox9-expressing cells in the adult periosteum may possess a potent ability to form or promote cartilage in response to bone injury. In addition, a requirement for Sox9-expressing cells in repair or homeostasis has not yet been established. The signaling pathways required for generating a cartilage callus from the periosteum in response to injury are also not well-characterized. The formation of the cartilage callus in fractures has been thought to involve a recapitulation of endochondral bone development (Bahney et al., 2014; Maes et al., 2010; Marsell and Einhorn, 2011; Yang et al., 2014; Zhou et al., 2014). One of the most well-known signaling pathways during endochondral bone development is the Hh pathway, activation of which promotes chondrogenic proliferation and osteocyte maturation (Long et al., 2001; Shi et al., 2017; St-Jacques et al., 1999). Studies have investigated Hh signaling during fracture repair, but due to conflicting results it remains unclear if Hh signaling has the same role in bone repair as it does during bone development. Genetic ablation of the obligate Hh co-receptor Smo in mice, using two different ubiquitously inducible Cre lines, resulted in reduced bone formation during fracture repair, yet was not reported to disrupt initial cartilage callus formation (Baht et al., 2014; Wang et al., 2010). Forced activation of Hh signaling throughout the mouse during fracture repair, using an inducible constitutively active Smo allele, resulted in increased bone formation (Baht et al., 2014), similar to what was seen upon engraftment of cells overexpressing Hh or treatment with an Hh agonist (Edwards et al., 2005; Huang et al., 2014; Zou et al., 2014). However, on which cell types Hh acts upon, and whether it regulates the decision to build the cartilage callus and/or other aspects of bone repair in mammals, has remained unknown. 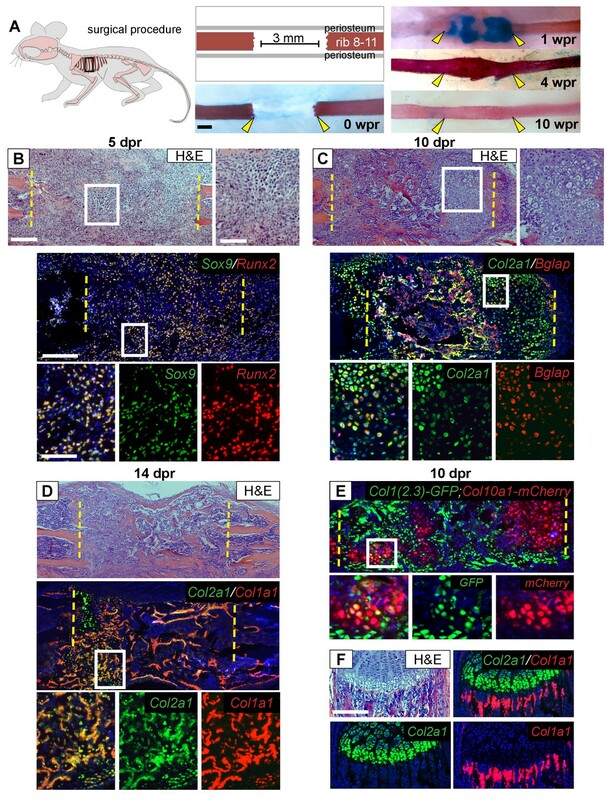 In this study we examine the role of the Sox9-expressing periosteal subpopulation (referred to as Sox9+ cells hereafter) during large-scale rib repair. This subpopulation appears to be a key player in orchestrating the formation of a large repair callus in the rib that consists of an unusual hybrid osteochondral cell type with properties of both chondrocytes and osteoblasts. 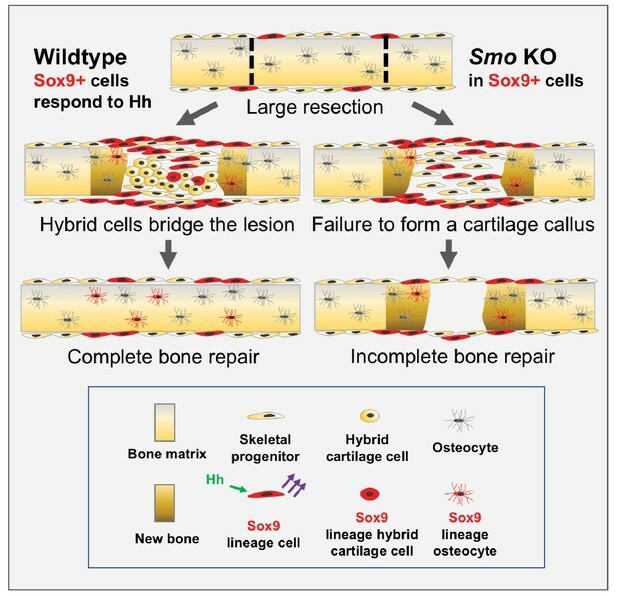 Loss of Smo in Sox9+ periosteal cells prior to injury results in a near-complete failure of cartilage callus formation and bone regeneration. This Sox9+ subpopulation must be able to respond to Hh signaling in order to initiate this process, indicating that Hh signaling’s role in bone repair is distinct from its role in bone development. Additionally, since Sox9+ periosteal cells contribute to only a minority of callus cells, we suggest that Sox9+ periosteal cells act as ‘messenger’ cells and orchestrate repair by inducing the differentiation of neighboring callus cells through non-autonomous signals. Overall our results indicate that bone regeneration does not fully recapitulate bone development, and that the periosteum consists of subpopulations that may have different roles/responses during repair. Like appendicular long bones, the bony portion of the rib develops via an endochondral process including growth plates at either end and a central hollow bone marrow cavity. Both human and murine rib bones display remarkable regenerative potential (Srour et al., 2015; Tripuraneni et al., 2015), however the cellular basis for such large-scale repair remains unknown. To better understand the cellular sequence of events during regeneration, we analyzed 3 mm rib bone defects at sequential time points up to 10 weeks post-resection (wpr) (Figure 1A). Histology at 5 days post-resection (dpr) revealed cells with a mesenchymal-like morphology filling the entire resected region (Figure 1B). We then observed formation of a substantial alcian-blue positive callus spanning most of the defect by 1 wpr (Figure 1A), with many of these cells displaying a cartilage-like morphology at 10 dpr (Figure 1C). Histology revealed increasing bone formation by 10 and 14 dpr (Figure 1C,D), with extensive alizarin-positive mineralization across the defect at 4 wpr and full remodeling to the pre-injury organization by 10 wpr (Figure 1A). Regeneration involves skeletal cells with hybrid osteochondral properties. (A) Schematic of the murine rib resection model. A 3 mm bone segment is resected from one rib (8-11), while the periosteum is carefully released and left in the mouse. Alizarin red and alcian blue whole mount staining indicates that repair occurs through a cartilage intermediate. The images show the outcome immediately after the resection at 0 wpr (weeks post resection, n = 2). At 1 wpr alcian blue positive material is evident between the cut ends (n = 3), by 4 wpr (weeks post resection) the lesion is fully-spanned by a mineralized callus (n = 2), while by 10 wpr remodeling has occurred (n = 2). (B–D) Histological sections stained with hematoxylin and eosin (H and E) (n > 5 for each time point) and near-adjacent double fluorescent RNA in situ hybridization (RNA-ISH) assays confirm the presence of a cartilage intermediate and show expression patterns in the repair callus. (B) At 5 dpr (days post resection) mesenchymal-like progenitor cells have moved into the resected region and are positive for the expression of both Sox9 (green) and Runx2 (red). The enlarged boxes with the separated color channels show co-expression in many of the cells within the resected region (overlap is yellow) (n = 3). (C) By 10 dpr bone and cartilage formation spans the resected region. Many cells that mediate repair express both the chondrocyte-associated gene Col2a1 (green), as well as the osteoblast-associated gene Bglap (red). The enlarged boxes show cells that have chondrocyte morphology expressing both Col2a1 and Bglap (n = 3). (D) At 14 dpr trabecular bone spans almost the entire resected region with only a small amount of cartilage at the cut ends; cells expressing both Col2a1 (green) and Col1a1 (red) are widespread. The enlarged boxes show the surface of newly formed trabecular bone where cells can be found that co-express Col1a1 and Col2a1 (n = 4). (E) At 10 dpr, animals double transgenic for Col1(2.3)-GFP;ColX-mCherry have mCherry (red) positive cells that are also expressing the osteoblast-specific reporter for Col1 (green). (F) Expression of Col2a1 (green) and Col1a1 (red) of the rib growth plate from an uninjured animal does not show a high degree of overlap (n = 5). Col2a1 is highly expressed in chondrocytes of the growth plate but not in osteoblasts forming new bone, while Col1a1 is highly expressed in the osteoblasts/cytes below the growth plate but not in cartilage cells. Scale bar for A = 500 microns, B-F = 200 microns, enlarged box H and E = 100 microns, enlarged box = 50 microns. Next, we used double fluorescent RNA in situ hybridization (RNA-ISH) to characterize the molecular identity of cells during the regeneration process. At 5 dpr, mesenchymal cells within the lesion co-expressed Sox9, a master regulator of the chondrocyte lineage (Akiyama et al., 2002; Lefebvre et al., 1997), and Runx2, a master regulator of the osteoblast lineage (Lian and Stein, 2003) (Figure 1B). While co-expression of chondrocyte and osteoblast markers has been observed during early bone development, normally as differentiation proceeds, a cell will express only chondrocyte or only osteoblast markers. Surprisingly, we observed co-expression of genes associated with chondrocyte and osteoblast differentiation within single cells throughout the repair process. For example, we see co-expression of Sox9 with the major osteoblast collagen gene Col1a1 (Figure 1—figure supplement 1A). As the callus matures bone and cartilage markers continue to be co-expressed at high levels. The major chondrocyte collagen gene Col2a1 was observed to be co-expressed with the late osteoblast marker Bglap (also known as Osteocalcin) (Figure 1C and Figure 1—figure supplement 1C), and with Col1a1 at both 10 and 14 dpr (Figure 1D and Figure 1—figure supplement 1B). We observed co-expression of chondrocyte and osteoblast markers in cells of both cartilage and osteoblast morphology, including cells on the surface of newly formed trabecular bone (Figure 1C,D, Figure 1—figure supplement 1C). Similar co-expression results were obtained using mice double transgenic for a reporter of hypertrophic chondrocytes (Col10a1-mCherry) and osteoblasts (Col1(2.3)-GFP) as well as using double immunofluorescence for COL1 and COL2 protein (Figure 1E, Figure 1—figure supplement 1D). In contrast, we did not observe co-expression of Col2a1 and Col1a1 in the rib growth plate under the same assay conditions (Figure 1F). Single colorimetric RNA-ISH assays of near-adjacent sections at 7 dpr confirmed co-expression of Sox9, Runx2, Col2a1, Col1a1, Bglap, and the hypertrophic cartilage collagen gene Col10a1 in cells of cartilage morphology within the callus (Figure 1—figure supplement 2). Together, these findings indicate that, in marked contrast to the growth plate, cells within the rib repair callus co-express cartilage and bone markers while displaying either a chondrocyte or osteoblast morphology. We therefore refer to these cells as ‘hybrid’ osteochondral skeletal cells. We next examined the source of the skeletal cells that mediate repair. These cells are likely derived from the periosteum, since removal of the periosteum along with the bone, results in a failure of cartilage callus formation (Figure 2—figure supplement 1) and subsequent bone repair (Tripuraneni et al., 2015). Sox9 is a master regulatory gene of chondrogenesis, and a previous study indicated that Sox9+ cells in the femur periosteum can contribute to callus formation after fracture (He et al., 2017). We therefore examined whether Sox9-expressing periosteal cells contribute to the repair callus during rib regeneration. To do so, we administered three consecutive daily doses of tamoxifen to Sox9-CreERT2; ROSA26-loxP-stop-loxP-tdTomato mice, followed by a 4-day chase to allow clearance of residual tamoxifen (Figure 2A, “Pre” regimen). In the absence of injury, we observed that Sox9-expressing cells were predominantly found in the periosteum and but only constituted 6 ± 0.3% of the population, with almost no labeled cells seen in the marrow compartment (Figure 2B). After rib resection, we found that 22 ± 1.3% of callus cells were tdTomato+ by 10 dpr with many of these cells having a typical chondrocyte morphology (Figure 2C). At 14 dpr (Figure 2C), we observed tdTomato expression in both chondrocyte-like cells, as well as osteoblast-like cells lining new trabecular bone (as defined by near-adjacent H&E sections), with contribution to osteoblast-like cells also evident by 21 dpr (Figure 2—figure supplement 2A). We observed fewer tdTomato+ cells at 14 dpr suggesting that as the callus matures, Sox9+ lineage cells are remodeled out and replaced by non-Sox9+ lineage cells. Pre-existing -expressing cells, thus contribute to only a minority of the cells that form the initial repair callus, including only a subset of the callus cells with hybrid osteochondral characteristics. Most of the cells in the rib callus are therefore derived from a lineage that did not express Sox9 prior to injury. In addition, similar to reports by He et al. (He et al., 2017) we found that also after femur fracture, our “Pre” tamoxifen regimen revealed contribution of pre-existing Sox9+ cells to the callus (Figure 2—figure supplement 3A). We further found that some of the cells within the femur fracture callus also co-expressed Col1a1 and Col2a1 strongly, suggesting a similar hybrid identity to that observed in the rib callus (Figure 2—figure supplement 3B). Since only a minority of the callus cells are derived from the Sox9-expressing periosteal subpopulation, as opposed to the majority of the callus cells that expresses Sox9 mRNA at 5 dpr (Figure 1B), we instead applied tamoxifen at the time of injury plus 2 days following (“Post” regimen, Figure 2D). This regimen will capture both the subpopulation that expresses Sox9 prior to injury as well as any cells that turn on Sox9 in response to injury. Consistent with detection of endogenous Sox9 mRNA expression in early callus cells (e.g. Figure 1B), we found that this later tamoxifen regimen labeled the majority of callus cells by 10 dpr (85.5 ± 2.8%) and most of the osteoblast-like cells lining newly forming trabecular bone at 14 (Figure 2E) and 28 dpr. Further, typical of osteocytes, some of the tdTomato+ cells at 28 dpr were found embedded in bone (Figure 2—figure supplement 2B). Thus, depending on when tamoxifen is administered (Pre vs. Post), either a minority or majority of the callus cells are labelled. Sox9-CreERT2 marks cells that participate in repair. (A) To target a sub-population of callus cells that arise from the periosteum, Sox9-CreERT2;tdTomato mice were injected for 3 consecutive days starting 7 days before analysis or before surgery. This tamoxifen induction schedule is referred to as ‘Pre’. The pie chart is a visual representation of number of cells affected in the callus at 10 dpr (red) and will be used throughout the figures as a reminder. (B) In uninjured Sox9-CreERT2;tdTomato mice, Sox9+ cells can be observed within the periosteum of the diaphysis by immunofluorescence (IF) for the tdTomato protein (red) (n = 3). They make up 6 ± 0.3% of the periosteal cells. (C) To determine if these cells participate in repair, rib resections were performed. At 10 dpr, lineage tracing of the Sox9+ cells show that the tdTomato+ expressing cells, 22 ± 1.3%, contribute to both cartilage and bone (n = 3) (IF for tdTomato). The enlarged images show chondrocytes, some of which are positive for tdTomato along with a near-adjacent section showing the histology of the area. At 14 dpr, tdTomato-expressing cells can be seen contributing to the trabecular bone. The enlarged image shows cells lining the trabeculae that are positive for tdTomato. 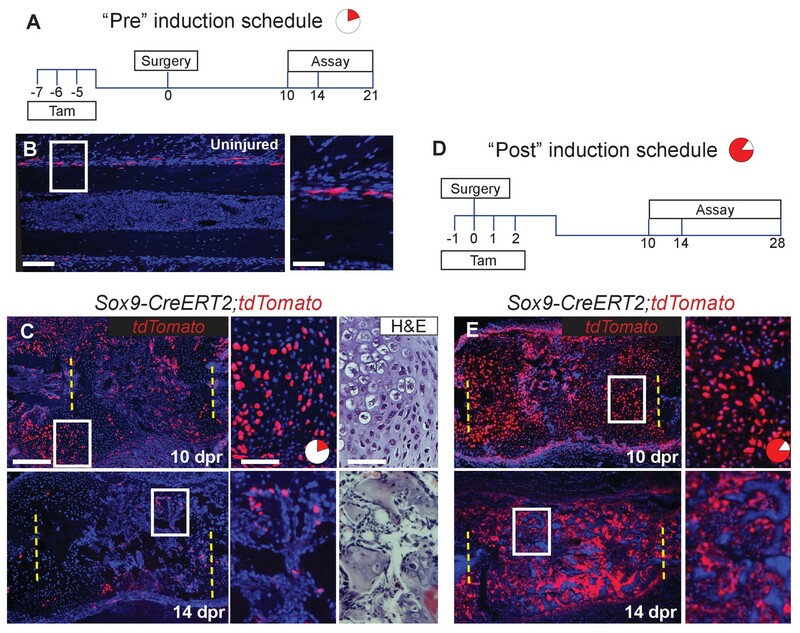 (D) To activate Cre in a larger percentage of cells that build the repair callus, Sox9-CreERT2;tdTomato mice were injected with tamoxifen for 4 consecutive days, starting the day before surgery took place, the day of surgery, and for 2 more days. This tamoxifen induction schedule is referred to as ‘Post’. Another pie chart is used to visualize that a much greater portion of the callus is affected using this tamoxifen induction schedule at 10 dpr (85.5 ± 2.8%). (E) At 10 dpr, tdTomato+ cells are present in developing cartilage and bone, as well as in the periosteum surrounding the callus (native tdTomato fluoresence from a cryosection). The enlarged panel shows cells with chondrocyte morphology that are tdTomato+. At 14 dpr, tdTomato+ cells can be seen building new trabecular bone. In comparison to the Pre induced mice, these mice have significantly more tdTomato+ cells within the repair callus (n > 2 for all time points). Scale bar B = 100 microns, enlarged box = 50 microns; C, E = 200 microns. Since we hypothesized that the Hh pathway may be important for large-scale repair, we first determined the expression of Hh ligands and Ptch1 after rib resection. As expected, based on the expression of Ihh in the growth plate, callus cells with cartilage morphology expressed Ihh and Ptch1. Interestingly we also detected the related ligand, Shh, in these cells (Figure 3A and C). At earlier stages Ihh expression was undetectable until 7 dpr and then only at very low levels in developing chondrocytes. However, Shh expression was readily detectable at 5 dpr and 7dpr similar to reports by others (Matsumoto et al., 2016) although at lower levels than found in cells with cartilage morphology (Figure 3A and C). Ptch1, a read-out of the Hh pathway, was also detected in tdTomato+ periosteal cells a 3 dpr, supporting the idea that these cells are responsive to a Hh signal prior to entering the callus (Figure 3—figure supplement 1A). Hh signaling during rib repair. (A) Expression of Ihh (red) and Shh (green) is evident in differentiating cartilage cells. At earlier stages, prior to cartilage formation, Ihh is hard to detect even at 7 dpr, while Shh is expressed at 5 dpr in many cells across the lesion. (B) Many cells express Smo (red) in the control callus at 7 dpr, while in the Post KO, Smo expression is not detectable. Fluorescent RNA-ISH for Smo (green) combined with IF for tdTomato (red) shows that when using the Pre induction schedule, most Tdtomato+ cells are negative for Smo expression, while many non-Sox9-positive lineage cells still express Smo. White arrow heads indicate tdTomato+ cells that are negative for Smo expression. (C) IF for the tdTomato protein (red) in combination with RNA-ISH for Shh and Ptch1 (green) at 7 dpr. In control mice, Shh and Ptch1 expression can be seen in many cells across the callus but most strongly in the chondrocytes. Cells neighboring tdTomato+ cells do not have strong Ptch1 expression. In Pre KO mice, tdTomato+ cells can be seen throughout the callus. Ptch1 expression is strongest in the small regions of cartilage that form at the cut ends. Scale bar A = 200 microns, enlarged boxes = 50 microns; B = 200 microns, enlarged boxes = 50 microns; C = 100 microns. We then tested the requirement for Hh signaling in large-scale bone regeneration by deleting Smo, the required Hh co-receptor, using the Sox9-CreERT2 transgene and employing either the Pre or Post tamoxifen treatment regimens. Using Smo RNA-ISH, we observed that the Post tamoxifen treatment resulted in deletion of Smo broadly (Figure 3B) as predicted given that Cre is active in most cells (Figure 2D). Pre tamoxifen treatment resulted in deletion of Smo in the Sox9-positive lineage subpopulation which were marked by including the tdTomato reporter in the cross (Figure 3B). This was expected, since deletion of Smo occurred prior to surgery and thus only a minority of the cells in the repair callus are expected to be null for Smo (Figure 2C). We then examined the callus at 7 dpr while there is a mix of both immature and differentiating cells. In control Pre tamoxifen treatment animals, tdTomato+ cells could be found scattered across the developing callus and were not preferentially found in clusters of differentiating chondrocytes suggesting that Sox9+ cells do not differentiate ahead of other cells in the callus (Figure 3—figure supplement 1B). In addition, in regions of the control callus where cells appeared immature and in Pre tamoxifen treatment calluses, there was no strong correlation between the tdTomato trace and the expression of Shh, or read-outs of Hh signaling such as Ptch1 or Gli2 (Pak and Segal, 2016) suggesting that in contrast to our earlier observations in the periosteum, that at these later stages, tdTomato cells are not strongly responding to a Hh signal (Figure 3C and Figure 3—figure supplement 1C). Furthermore, in cells neighboring Tdtomato+ cells, we did not see any enrichment of Ptch1 or Gli2 expression suggesting that they were not receiving a potent Hh signal that could be released by Tdtomato+ cells. We then investigated the consequence of Smo deletion on cartilage callus formation. Surprisingly, Smo deletion using either the Pre or Post tamoxifen treatment resulted in a similarly near-complete loss of the cartilage callus at both 7 and 10 dpr (Figure 4A, Figure 4—source data 1), despite the Pre treatment only deleting Smo in a small subset of callus progenitors (Figures 2C and 3B). After Smo deletion, although cells did not form a mature callus, they still co-expressed Sox9 and Runx2 at 5 dpr (Figure 4—figure supplement 1A). At 10 dpr, in contrast to co-expression of Col2a1 and Col1a1 throughout the control callus, the few Col1a1-expressing cells that formed after Smo deletion lacked high levels of Col2a1 and vice versa, demonstrating a lack of hybrid osteochondral cells (Figure 3B). Requirement of Hh signaling for rib callus formation. (A) Safranin O staining was used to visualize cartilage formation. At 10 dpr, the control callus has significantly more cartilage then both the Pre KO and Post KO repair calluses. In the graph showing the quantification of cartilage based on Safranin O staining at both 7 and 10 dpr, data are presented as compared to the average of controls, normalized to 1. When comparing both the Pre and Post KO to the control, the difference in the amount of cartilage is statistically significant, but between the Pre and Post KO, there is no statistically significant difference. See Figure 4—source data 1. (B) Double fluorescent RNA-ISH of Col1a1 (red) and Col2a1 (green) expression shows that there are fewer hybrid cells that mediate large scale repair in the KO calluses when compared to the control. Most of the cells in the control callus express high levels of both Col1a1 and Col2a1, while in both Pre and Post KO calluses many of the chondrocytes only express Col2a1. The enlarged boxes show cells with chondrocyte morphology with color channels merged and separated. (C) IF against pHH3 was used to mark cells undergoing proliferation. The percentage of positive cells in the callus was calculated vs. the total number of callus cells. No statistically significant difference between the control (n = 6, 5) and the Sox9-CreERT2; Smofl/fl (n = 7, 5) mice at 7 or 10 dpr (p=0.460 and 0.210 respectively) was evident. Representative panels are shown. See Figure 4—source data 2. (D) TUNEL staining was used to detect apoptotic cell death at 7 and 10 dpr. The graph shows the percentage of green pixels, in comparison to total pixels in the callus area. There is no statistically significant difference between the control (n = 4,3) and Sox9-creERT2;Smofl/fl (n = 6,6) mice at 7 and 10 dpr (p=0.243 and 0.141 respectively). Representative panels are shown. See Figure 4—source data 3. Whisker bars are mean ± SEM. Statistical differences were determined using the unpaired t test. *p value < 0.005 **p value < 0.001; Scale bar A = 200 microns, B = 50 microns, enlarged box = 25 microns, C, D = 200 microns. The lack of callus formation and hybrid cells following Smo deletion was not reflected by altered numbers of pHH3+ proliferative or TUNEL+ apoptotic cells at either 7 or 10 dpr, and lineage tracing with the tdTomato reporter revealed similar numbers of cells within the resection site at 10 dpr (Figure 4C, Figure 4—source data 2, Figure 4D, Figure 4—source data 3, Figure 4—figure supplement 1B, Figure 4-figure supplement-source data 1). Thus, Hh signaling is likely not required for the early proliferative expansion in response to injury or for cell survival. Instead, we conclude that Hh signaling is required in Sox9+ cells for promoting the differentiation of non-Sox9 lineage cells into hybrid osteochondral cells of the callus. When the Sox9+ Pre population is null for Smo, non-Sox9 lineage cells are still unable to differentiate (despite expressing Ptch1) resulting in the near complete failure of callus formation. Thus, this minority Sox9+ periosteal lineage population plays a critical initiating role in callus differentiation. We next assessed the consequence of defective callus formation on subsequent regeneration of rib bone in Smo-deleted animals. In contrast to control animals showing robust Col1a1 and Col2a1 co-expression in cells lining new trabecular bone at 14 dpr, deletion of Smo using either the Pre or Post regimens resulted in a near complete absence of co-expressing cells. Instead, only small numbers of Col2a1-only cells were observed, primarily near the cut ends of the bone, while cells with osteoblast morphology expressed predominantly only Col1a1 (Figure 5A). Analysis of H and E-stained histological sections confirmed a marked decrease in bone formation at 14 dpr, despite substantial mesenchyme still observed in the resection site, with the magnitude of the bone defect similar in both regimens (Figure 5B). We found that ‘Late’ removal of Smo (injection of tamoxifen at 3–5 dpr targeting the whole callus) only caused a slight delay in repair with a fully bridged callus evident at 14 dpr (Figure 5—figure supplement 1) suggesting that the decrease in bone formation seen in both the Pre and Post regimens is largely related to reduced cartilage callus formation. Whole-mount staining with alizarin red and alcian blue confirmed a failure of bone union at 4 and 6 wpr in both Pre and Post conditions (Figure 5C). These findings demonstrate that the Sox9+ subpopulation requires Hh signaling not only to build the repair callus but that a substantial cartilage callus may be needed to efficiently regenerate bone. Hh signaling is required for bone formation. (A) Double fluorescent RNA-ISH of Col1a1 (red) and Col2a1 (green). The enlarged boxes show an area of newly formed trabecular bone in separate channels. In both KO contexts, the cells building the trabecular bone express Col1a1 at high levels, but are largely negative for the expression of Col2a1. While, in the control, cells lining the trabecular bone express high levels of both. White arrowheads point to differentiating osteocytes that still express Cola1. (B) H and E staining at 14 dpr shows the histology of the repair callus in control, Pre, and Post KO animals. Both KO mice have much less bone than in controls and many of the cells that have entered the lesion have a progenitor-like morphology. Bone formation was quantified based on histology and the data is shown compared to the average of controls which has been normalized to one in the graph. At both 10 and 14 dpr, both the Pre KO and the Post KO have significantly less bone when compared to the controls. No statistically significant difference is seen when comparing the Pre to the Post KO. See Figure 5—source data 1. Whiskers show mean ± SEM. Statistical differences were determined using the unpaired t test. *p value < 0.0002 (C) Alizarin red and alcian blue whole mount staining show that at 4 wpr, the resected region is fully spanned by mineralized material in control mice (n = 3), while both the Pre KO and Post KO animals fail to heal. Similar results can still be seen at 6 wpr. Scale bar A, B = 200 microns, enlarged box = 50 microns, C = 500 microns. We find that building an extensive callus of a unique type of hybrid osteochondral skeletal cell is essential for successfully bridging large gaps in adult mammalian rib bone. During this process, Hh signaling plays a critical role, distinct from that in the developing growth plate, in promoting the ultimate differentiation of these hybrid osteochondral skeletal cells. Further, we provide genetic evidence that Hh signaling acts upon a rare periosteal subpopulation of Sox9-expressing cells, that behave as messenger cells. These Sox9+ periosteal cells then stimulate, through a yet to be determined signal, their neighboring non-Sox9-lineage cells, which constitute a majority of the callus, to differentiate and build new callus and bone (summarized in Figure 6). Model for large-scale bone repair. In wildtype animals, represented by the left side of the diagram, extensive gaps in the mouse rib (as defined by the hatched lines) can naturally regenerate. A Sox9-expressing periosteal subpopulation (indicated in red) along with other skeletal progenitors (yellow) proliferate and migrate into the lesion. These Sox9+ lineage cells require Hh signaling (green arrows) to be able to signal via a yet-to-be identified mechanism to neighboring cells (purple arrows). This signal induces neighboring cells to differentiate into a reparative callus with hybrid osteochondral qualities, leading to complete bridging and bone repair. Sox9+ lineage cells ultimately contribute to the callus and regenerated bone (indicated in brown) although they are represented in the minority. The right side of the diagram represents the outcome of a Pre regimen KO of Smo (tamoxifen administered prior to injury). When Smo is removed from the Sox9+ periosteal subpopulation prior to resection, the Sox9+ lineage cells can still contribute but are not activated and therefore do not relay a differentiation signal to neighboring cells. Thus, the entire callus fails to differentiate into a hybrid osteochondral callus. While some bone forms via direct ossification, this is not sufficient and healing fails. We observe high-level co-expression of genes typically associated with cartilage (Sox9, Col2a1, Col10a1) or bone (Col1a1, Bglap) in callus cells during murine rib bone regeneration. This is in marked contrast to the largely exclusive expression of cartilage versus bone genes in the developing growth plates, although hypertrophic chondrocytes do express low levels of many bone-associated genes (Gerstenfeld and Shapiro, 1996). The trajectory of hybrid cells is also fundamentally different from the subpopulation that is proposed to ‘transdifferentiate’ from chondrocytes to osteoblasts in the growth plate (Bahney et al., 2014; Shimomura et al., 1975; von der Mark and von der Mark, 1977; Yang et al., 2014; Zhou et al., 2014). In the growth plate, these transdifferentiating cells express chondrocyte-associated genes first and then, through a process that remains mysterious, turn off chondrocyte-associated genes and turn on osteoblast-associated genes. Here, we confirm a similar process of ‘first cartilage and then bone’ in the rib growth plate. In contrast, in the regenerating rib, we observe that callus cells co-express cartilage- and bone-associated genes at the earliest stages. We propose that they then maintain this hybrid osteochondral identity as they shift from making a cartilaginous and then a bone-like matrix. We also observe a similarly hybrid osteochondral cell in the femur fracture callus, although further investigations will be required to determine how similar these cells are between the rib and femur callus. Moreover, similar hybrid cells have been reported during zebrafish jawbone repair (Paul et al., 2016) suggesting that skeletal cells with dual chondrocyte/osteoblast properties may be critical for bone regeneration across vertebrate species. Co-expression of bone and cartilage programs in the same cell is certainly not unique to the regenerating callus. For example, Col1a1 and Col2a1 are also highly expressed in fibrocartilage cells, however this tissue is morphologically quite different in terms of its high fiber to cell ratio when compared to the regenerating rib callus (Benjamin and Ralphs, 2004). Of note, a rare developmental skeletal type has been described, historically referred to as ‘chondroid bone’ or ‘secondary cartilage’, that does share many features with the hybrid osteochondral cells we observe during regeneration (Goret-Nicaise, 1984; Shibata and Yokohama-Tamaki, 2008). Therefore, it may be that these cells are not unique to regeneration, but rather are selectively utilized due to their ability to rapidly proliferate in a relatively avascular environment (a property of cartilage [Dennis et al., 2015]) while directly producing mineralized matrix (a property of bone). Whereas some bone does form in our Smo-deleted mice, this is not sufficient to bridge the lesion and healing fails, resulting in a persistent non-union. Cells within this bone do not display hybrid chondrocyte/osteoblast character, consistent with residual bone forming by direct ossification rather than ossification through a callus intermediate. These findings suggest that during large-scale bone regeneration, Hh signaling in Sox9-expressing periosteal cells is selectively required for the formation of a hybrid osteochondral callus. Hh signaling may play an important but more subtle role in osteocyte maturation as fractures still heal in the absence of Smo but with decreased or delayed bone formation (Baht et al., 2014; Wang et al., 2010). Similarly, we see production of bone (although delayed) in our rib resection model with a Late KO of Smo (Figure 5—figure supplement 1). In contrast to our rib model, however, loss of Smo in these femur/tibia fracture assays still resulted in the formation of a cartilage callus. We do not know why these results contrast from ours where cartilage callus formation is dramatically compromised. One possibility is that the efficacy of Smo removal in these fracture experiments was not efficient during cartilage callus stages, alternatively, there could be different requirements for Hh signaling depending on the type of injury (resection vs. fracture). Interestingly, the formation of a cartilage callus may not be as critical during fracture repair, as fractures can repair solely through direct ossification (Colnot et al., 2003). While in contrast, during large-scale repair, the process of direct ossification is not sufficient to build large pieces of bone and instead, building a hybrid osteochondral callus may be particularly important for bridging large bone gaps. Hh signaling is known to promote chondrocyte proliferation and osteoblast differentiation in the developing growth plate (Long et al., 2004; Long et al., 2001). Surprisingly, we found that loss of Hh signaling did not affect the early proliferation of callus cells or the differentiation of osteoblasts in the residual directly ossifying bone. Instead, we provide evidence that Hh signaling has a distinct and essential role in promoting the differentiation of Sox9/Runx2 expressing progenitors into the hybrid osteochondral skeletal cells that form the repair callus. These results indicate that the regeneration of the rib bone, including its dependence on Hh signaling, does not simply the recapitulate developmental processes seen at the growth plate. While the heterogeneity of the cells in the periosteum and their lineage relationships remain incompletely understood, we propose that Sox9+ periosteal cells or a subpopulation within them, play an essential instructive role for callus formation during large-scale bone regeneration that has not been previously described in the context of repair. The Sox9+ periosteal subpopulation may be distinct from the previously described subpopulations that are Gli1+, αSMA+, Gremlin1+, or Axin2+, as RNA-seq analysis of the periosteum from an uninjured femur indicated that Gli1, αSMA, Axin2, and Gremlin1 are not highly expressed in the Sox9+ cells (He et al., 2017). Future studies tracing the lineage of these other populations and determining their dependence on Hh signaling will be needed to resolve whether Sox9+ cells represent a subset of one of these other more abundant populations, or alternatively a distinct progenitor subpopulation. In addition, efforts to delineate potential differences that may exist in periosteal populations from different bones, may explain why some bones regenerate well, while others do not. One of the most striking findings from our study is that Sox9+ cells are essential for efficient callus formation and rib bone regeneration, despite contributing to only a minority of cells within the callus and regenerated bone. Based on this observation, we propose that the Sox9+ cells act as ‘messenger’ cells by releasing a yet to be determined signal that promotes the differentiation of neighboring cells Sox9-negative lineage cells. One possibility is that Sox9+ progenitors differentiate early in response to the initial Hh signal (potentially Shh, since strong expression is evident early) and then propagate another wave of Hh signaling to neighboring Sox9-negative cells, similar to the role of Hh in the morphogenetic furrow during Drosophila eye development (Domínguez and Hafen, 1997; Kumar, 2011; Ma et al., 1993). The failure of Sox9+ cells to differentiate and thus express Shh and Ihh, could then lower the total Hh signal in the callus to below a critical threshold need for cartilage differentiation. However, our results suggest that Sox9+ cells are not the first to differentiate and while they likely respond to a Hh signal early in the periosteum, they are likely not strong propagators of a further Hh signal as cells nearby Sox9+ lineage cells do not display a strong upregulation of Hh pathway read-outs as the callus differentiates. While a response to Hh signaling may require more sensitive assays, we found the expression of both Ptch1 and Gli2 to be very low in undifferentiated cells at 7 dpr in both control and Pre Smo KO calluses Figure 3C and Figure 3—figure supplement 1) suggesting that they were not receiving a potent secondary Hh signal. In addition, the expression of Shh was not particularly strong in the tdTomato+ cells at this stage (Figure 3C). Thus, we instead favor a hypothesis, that in response to Hh signaling Sox9+ cells emit another to-be-identified relay signal. This signal then orchestrates repair by promoting the differentiation of neighboring cells from a non-Sox9+ lineage into mature matrix-producing hybrid osteochondral skeletal cells that bridge the lesion (Figure 6). It is possible that Hh signaling may have an additional role in later stages of repair (osteocyte differentiation), but our study supports a critical role early in large-scale rib repair. Future investigations into factors produced by Sox9-lineage cells that promote callus formation may lead to better strategies of boosting bone repair in other parts of the body that do not heal as effectively. All procedures were approved by the University of Southern California Institutional Animal Care and Use Committee (Protocol #: 11256, 20639). We used the following mouse lines: Sox9-CreERT2 (Sox9tm1(cre/ERT2)Haak [Soeda et al., 2010]), R26R-tdTomato (B6;129S6-Gt(ROSA)26Sortm9(CAG-tdTomato)Hze/J; JAX 007905), Smofl/fl (Smotm2Amc/J; JAX 004526, Col1a1(2.3-GFP) (B6.Cg-Tg; Col1a1*2.3-GFP)1Rowe/J;JAX 013134), Col10a1-mCherry (Maye et al., 2011). To generate Sox9-CreERT2;tdTomato;Smofl/fl mice, Sox9-CreERT2;tdTomato males were crossed to Smofl/fl females and Sox9CreERT2;tdTomato;Smofl/+ offspring males were back-crossed to Smofl/fl females to generate Sox9-CreERT2;tdTomato;Smofl/fl offspring. Both male and female mice between 6–8 weeks old were used for experiments. 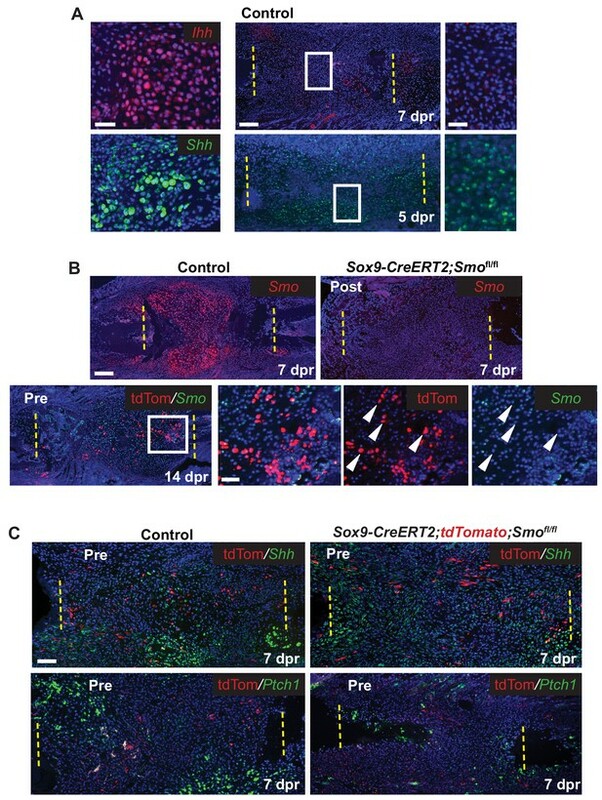 Control mice were uninduced siblings or tamoxifen-induced Sox9-CreERT2;tdTomato mice. Rib resections were performed as previously described (Tripuraneni et al., 2015) with the modification that a bone segment of 3 mm was removed and that post-operative pain was managed with buprenorphine SR (ZooPharm) at a dose of 0.5 uL/gram. Rib repair was assessed after set healing time points: 0 dpr – 10 wpr. To induce Cre recombination, 100 uL of a 20 mg/ml stock of Tamoxifen (Sigma-Aldrich: T5648-1G, dissolved in corn oil at 60°C for 2 hr) was used per injection. Tamoxifen injections were administered intraperitoneally using a 25-gauge needle. Two injection schedules were used: 1) three consecutive injections starting 7 days before resection ('Pre' regimen), 2) four consecutive injections starting 1 day prior to surgery ('Post' regiment). Uninduced controls were injected with corn oil only. Femur fracture assays were carried out as previously described (He et al., 2017). Samples were fixed with 4% PFA overnight at room temperature, decalcified with 20% ETDA at pH 7.5 for 10–14 days, and then processed for paraffin embedding. A microtome (Shandon Finesse Me+: 77500102) was used to cut paraffin sections seven microns thick. The sections were mounted on Superfrost Plus slides (VWR, 48311–703). After deparaffinizing slides in Citrisolv and rehydrating, H and E or Safranin O staining was carried out using standard protocols. Skeletal staining was performed on EtOH-fixed samples (Rigueur and Lyons, 2014). To visualize native tdTomato fluorescence, samples were fixed in 4% PFA on ice for 30 min and placed in 30% sucrose overnight at room temperature. The samples were embedded in OCT and flash frozen in an EtOH dry ice bath. 10 µM thick sections were cut using a Leica CM3050 S cryostat. Tape (cryofilm type 3C(16UF) C-FUF303) was used to preserve the histology of the bone (Kawamoto, 2003). OCT was removed with a 1xPBS wash before mounting. Detection of pHH3 and Tdtomato proteins was carried out on paraffin sections. Slides were de-waxed and cells were permeabilized with 0.1% Triton-X followed by antigen retrieval in 10 mM sodium citrate, 0.05% Tween 20, pH of 6.0 in a 95°C water bath for 30 min. Slides were blocked in 20% serum for 1 hr and then incubated with the primary antibodies overnight at 4°C (anti-pHH3, Millipore: 06–570, 1:200; anti-mCherry which also detects tdTomato, Novus Biological: NBP2-25158SS, 1:200; anti-Col1, Abcam: ab34710, 1:250; anti-Col2, Southern Biotech: 1320–01, 1:200). Secondary antibodies used were: Alexa Fluor 568 goat anti-rabbit (ThermoFisher: A-11011, 1:250), Alexa Fluor 568 goat anti-chicken (Abcam: ab175477, 1:500), and Alexa Fluor 488 donkey anti-goat (Abcam:ab150129, 1:500). To detect apoptosis, the In Situ Cell Death Detection Kit, Fluorescein (Sigma-Aldrich: 11684795910) was used as directed. Fluorescent and colorimetric RNA in situ hybridization (RNA-ISH) was performed on 7 µm paraffin sections as previously described (Paul et al., 2016). Complementary DIG or FL labeled RNA probes were generated following kit instructions (Sigma-Aldrich: 11277073910 and 11685619910) and were detected with Anti-Digoxigenin-POD (Sigma-Aldrich: 11207733910) and Anti-Fluorescein-POD (Sigma-Aldrich: 11426346910). For double fluorescent RNA-ISH the TSA Cyanine three and Fluorescein system from Perkin Elmer was used as directed (NEL753001KT). For colorimetric RNA-ISH Anti-Digoxigenin-AP (Sigma-Aldrich: 11093274910) was used to detect the probes. Slides with fluorescence were mounted with Vectashield with DAPI (Vector Laboratories: H1200) and were imaged with a Nikon AZ100 Macroscope and photographed (Nikon Digital sight DS-Fi1). Fluorescent images were edited for contrast and color levels in Adobe Photoshop CS5. For quantification, all images were taken at the same magnification for each data set. Student’s t-test was used to compare groups. A probability value of 0.05 or less was marked as significant. Each data point was plotted on the scatter plot and the mean was defined on the graph, unless the data set was normalized. Statistical tests were performed using GraphPad. To determine the amount of cartilage, a mid-sagittal section through both mutant and control sample was stained with Safranin O and quantified in ImageJ. In brief, the image was thresholded for the Safranin O color (orange) and the area of the color was measured. To determine bone area, samples were stained with H and E and analyzed with the BioQuant image analysis program. The bone area was compared to the entire resected area. The values were normalized within each time point. Quantification of the number of cells expressing pHH3 was carried out using the analyze particle function in ImageJ with the repair callus defined as the area of interest. The red channel was used to count the number of cells positive for pHH3 while the blue channel was used to count the total number of cells (nuclei stained with DAPI). The ratio of pHH3 positive cells to total cells was used to calculate the percentage of cells in mitosis. This method was also used to quantify the number of tdTomato+ cells within the callus. To quantify apoptosis, Adobe Photoshop CS5 was used to analyze the green channel. The number of green pixels compared to the total number of blue pixels (DAPI) in the region of interest was calculated. Analysis of pHH3 and TUNEL positivity was done on de-identified images by several laboratory members. Journal of Bone and Mineral Research 29:1269–1282. Journal of Orthopaedic Research 32:581–586. Journal of Clinical Investigation 127:3327–3338. International Review of Cytology 233:1–45. Journal of Bone and Mineral Research 24:274–282. Tissue Engineering Part B: Reviews 21:247–266. Journal of Cellular Biochemistry 88:873–884. Journal of Cellular Biochemistry 62:1–9. Archives of Histology and Cytology 66:123–143. Plastic and Reconstructive Surgery 117:2011–2018. Molecular and Cellular Biology 17:2336–2346. Journal of Bone and Mineral Research 29:1283–1294. Annals of Plastic Surgery 7:341–346. Journal of Bone and Mineral Metabolism 31:390–398. Methods in Molecular Biology 1130:113–121. Journal of Bone and Mineral Research 30:297–308. Journal of Orthopaedic Research 20:1091–1098. Journal of Visualized Experiments 52375. The Journal of Bone and Joint Surgery. British Volume 59-B:458–464. The American Journal of Pathology 177:3100–3111. Journal of Orthopaedic Surgery and Research 9:102. The authors have addressed our concerns during the re-revision. Over time, the focus of the paper has changed considerably; the authors now also suggest there may exist secondary signals from the Sox9 lineage cells that are not Hh which are critical in this process of large-scale repair. Another concern we had was regarding Figure 2C, which has also been addressed. The quality of the data is now convincing. Thank you for submitting your article "Pioneer cells orchestrate large-scale skeletal regeneration in mammals" for consideration by eLife. Your article has been reviewed by three peer reviewers, and the evaluation has been overseen by Marianne Bronner as the Senior Editor and Reviewing Editor. The reviewers have opted to remain anonymous. In this paper, Kuwahara and colleagues investigate the regeneration of rib bones in mice, using a model of rib ablation. They characterized the population of cells, all derived from the periosteum, which repair the resected rib. They find that in the repairing callus, cells co-express chondrocyte-specific and osteoblast-specific markers. Using lineage tracing techniques and Sox9 as a marker of the chondrocyte lineage, they find that the callus comprises a minor (1/3) population derived from cells expressing Sox9 in the periosteum, while the majority (2/3) upregulate it after resection. The ablation of Smo in the minor population or in the entire population leads to a similar phenotype, defects in callus formation and bone differentiation. The authors conclude that the periosteum-derived Sox9 cells play an essential function in the HH-mediated bone regeneration of ribs. 1) The main concern with the manuscript is that a mechanistic understanding of the phenotype obtained after deletion of Smo in the two experimental paradigms is lacking. How is it that the arrest of HH signalling in a portion of the cells that repair the rib impacts the entire differentiation program of this population? 2) Is Hh signaling uniquely involved in regeneration or simply necessary in general for ossification? In this work, Kuwahara et al., examine rib regeneration using a murine model. They show that the rib regenerates from cells located in the periosteum and that Hedgehog signaling is required for the initial differentiation of the cells that will comprise the regenerating tissue. These cells are derived from a population of cells that express Sox9, and the appear to give rise to cells that co-express Col1 and Col2. They propose a model whereby a rare population of Sox9+ cells in the periosteum recruit other cells to participate in the regenerative process by making the "hybrid cells" that co-express Col1 and Col2. The major finding of this work are two-fold. First, what appear to be chondorcytes co-express Col1 and Col2-markers of osteoblasts and chondrocytes respectively. 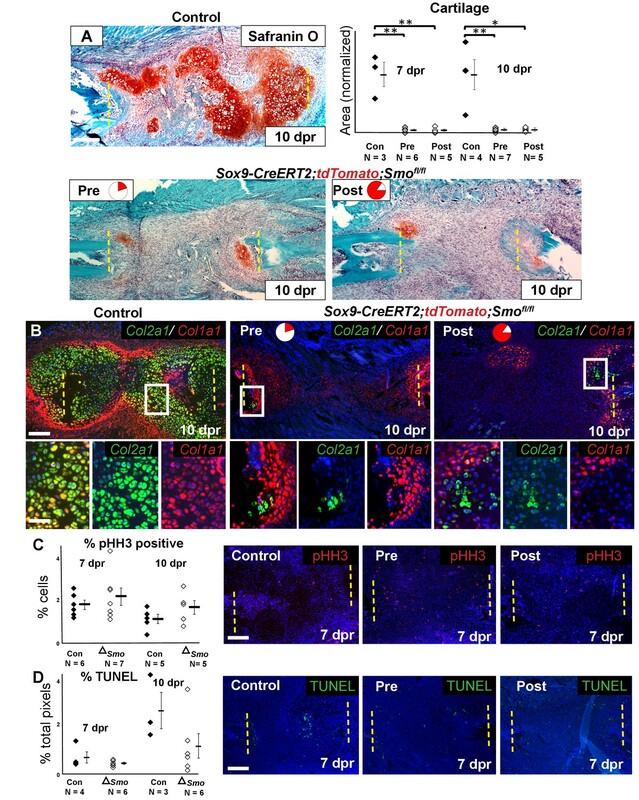 2nd that deleting Smoothened from a Sox9+ population of cells in the periosteum leads to poor healing and indicating that hedgehog signaling is required at an early stage of cell differentiation. While this is interesting some fo the conclusions are not supported by the experimental approach and resulting data, and there are some concerns about the exclusive use of in situ hybridization to demonstrate the presence of hybrid cells. I disagree that mammals exhibit a limited capacity for bone repair. In fact, bone is one tissue that exhibits excellent regenerative potential in mammals. The entire basis of distraction osteogenesis is based on the ability of bone to regenerate itself. Further, there is no comparison of healing of the rib to any other bone in the body in this work. So saying the ribs are a "notable exception" is not necessarily correct. The statement that not all cells in the callus are derived from Sox9-expressing progenitor cells is not supported in the literature (He et al., 2017). In fact, Figure 2E shows that by extending the labeling protocol to 2 days after injury, there is a large contribution of Sox9+ cells to the regenerating tissue. It would be interesting to assess rib healing when the periosteum is removed along with the bone. Do hybrid cells still appear? Why is there no Col1 expression in the cells embedded in the new trabecular bone? Do the hybrid cells co-express Col1 and Col10? Or just Col1 and Col2? It is hard to assess this from the figures. Shh expression has been examined in other work on rib fracture models (Matsumoto et al., 2016), and it appears the results are different from those here. This should be discussed. Where is Shh, Ihh, Ptc expressed prior to chondrocyte differentiation? It seems this is a key piece of data that is missing. Instead Figure 3 shows expression of these genes in the chondrocytes. However, knock-out of Smoothened affects an earlier stage of healing. Work by Baht has already shown that Hedgehog signaling is dispensable during expansion of the cartilage in the callus. Thus, there is a disconnect between the expression patterns of Shh, Ihh, Smo, and Ptc, and the experimental data. In Figure 5, I do not see evidence in the manuscript of Sox9+ osteocytes or hybrid cartilage cells that do not express Sox9. Also, it is not clear why there are Sox9- hybrid cells since when lineage tracing was extended to after the injury, nearly all of the regenerated tissue was derived from labeled cells (Figure 2E). It seems that many more cells express Sox9 after injury, which could just reflect activation of a larger number of the stem cell pool by the injury itself, and not reflect a recruitment of these cells by the prior Sox9+ population as discussed in paragraph one of the Discussion section. To show that these cells act as pioneers that recruit other cells, the Sox9+ cells would need to be depleted prior to injury and healing examined. Figures 2 and Figure 2—figure supplement 2 should be combined. It is difficult to compare the location of the images when the histology and in situs are in separate figures. An additional method of assessing co-expression of Col1 and Col2 should be considered, either PCR after FACS, immunohistochemistry, or an alternate method. Since this is a central tenet in the paper, a more robust analysis would be useful. It is known that rib bones have a higher capacity for repair than most bones, but the basis for this regenerative capacity is unknown. The authors investigate this process by analyzing the repair of rib lesions in adult mice. They propose that SOX9 expressing cells in the periosteum are important during skeletal regeneration post injury. During this process, cells attain a characteristic intermediate "hybrid state" in the callus, wherein they express markers for both nascent/mature cartilage, as well as differentiated osteoblasts. This is in contrast to the typical process of endochondral ossification, where specific markers are expressed in discrete populations of cartilage with minimal overlap. The authors moreover implicate hedgehog signaling in playing a critical role during formation of the intermediate callus structure during regeneration. They speculate that Hh regulates the differentiation of hybrid cells and eventually leads to large-scale regeneration of these bones. The analysis presented is detailed and benefits from the use of multiple markers. At the same time, the general message of the work is unclear except to present the idea that cells in the callus are in a "hybrid state" and as such it is not obvious that the manuscript is well suited for a general biology audience. 1) During endochondral ossification in the growth plate, SOX9 levels are known to vary in distinct cartilage cell types at various stages of differentiation (Leung et al., 2011, PMID 22072985). Therefore, the authors need to justify that all Sox9+ cells of the periosteum are the pioneer population, or they would have to use another marker (and another Cre line, see below). 2) The authors are using a Sox9CreERT2 line to lineage trace the source of cells that give rise to the callus. It is unclear from the data, if most cells are recruited from the region neighboring the injury site or from more distant cells. 3) Other periosteum/osteoblasts specific CreERT2 lines should have been used to validate the periosteum as the source of cells in the callus. 4) The authors mention in their opening statement that "most bones in mammals display limited capacity for repair". Is it known if there is also a reduced number of Sox9+ cells in other bones which have limited repair capacity? 5) Does hedgehog signal in an autocrine rather than paracrine manner? It would be good to know if only a subset of cells activate Gli or specific Hh target genes. 6) This reviewer was not convinced by the studies implicating Hh signaling in regeneration. Although the authors observe that disruption of Smo leads to a reduction in Col2a1/Col1a1 expression in the callus, hedgehog signaling cannot have a unique role in regeneration since it also has a very general role in endochondral ossification. In this paper, Kuwahara et al. investigate the regeneration of rib bones in mice, using a model of rib ablation. They characterized the population of cells, all derived from the periosteum, which repair the resected rib. Using ISH they found, within the repairing callus, cells (which they name "hybrid" skeletal cells) that co-express chondrocyte-specific and osteoblast-specific markers. Using lineage tracing techniques and Sox9 as a marker of the chondrocyte lineage, they find that the callus comprises a minor (1/3) population derived from cells expressing Sox9 in the periosteum, while the majority (2/3) upregulate it after resection. The ablation of Smo in the minor population or in the entire population leads to a similar phenotype, defects in callus formation and bone differentiation. The authors conclude that the periosteum-derived Sox9 cells play an essential function in the HH-mediated bone regeneration of ribs. In general, the study is interesting and it could be worth publishing in a good journal. The illustrations are of excellent quality, even though a little more infos and enlargements would sometimes be helpful. Below are some comments about the text and the terminology used. In addition, there are a few technical points that could rather easily be addressed. The main concern with the manuscript is that a mechanistic understanding of the phenotype obtained after deletion of Smo in the two experimental paradigms is lacking. How is it that the arrest of HH signalling in a portion of the cells that repair the rib impacts the entire differentiation program of this population? Without this, the study seems a little preliminary. Why the question that is addressed here is worth studying and what are the key findings of the study could be explained more clearly in the Introduction. For non-specialists it takes a lot of reading of this and many other papers (and there are many) to understand what is novel about this study. The terms "pioneer" and "hybrid" are odd. Pioneer: that is first to explore or to do something novel: Darwin and Mendel, certainly; pioneer neurons, pioneer muscle cells, maybe. But here it does not seem justified. Hybrid: characterizes the progeny of two distinct breeds, species. Wouldn't it be more correct to call them bi-potent progenitors? "Using the tdTomato reporter, we confirmed that the Pre tamoxifen treatment resulted in deletion of Smo in tdTomato+ cells within the resection site. In contrast, the Post tamoxifen treatment resulted in deletion of Smo throughout the resection site (Figure 3—figure supplement 1C)"
These phrases are unclear: the authors oppose "within" and "throughout". What is the difference? Explain better. Enlarged pictures (maybe insets) of the Figures 1B and C with indications to identify the mesenchymal-like and cartilage-like cells would help non-specialists. Some ISH data are a little confusing. First, they are done at different times: 5 dpr in Figure 1 and 7 dpr in Figure 1—figure supplement 1. Adding to the confusion is the fact that the lineage analyses are started at 10 dpr, such that it is difficult to compare ISH and lineage analyses. Second, the Sox9 fluorescent ISH indicates that just about all cells of the callus are positive (Figure 1—figure supplement 1A), while a small proportion of them are positive using a colorimetric approach (Figure 1—figure supplement 2). Could you comment this discrepancy? "To understand whether cells also upregulate Sox9 expression during callus formation and to also potentially capture more cells within the callus, we instead applied tamoxifen at the time 18 of injury plus 2 days following". This seems to be an obscure reason to do this experiment. It would be more appropriate to justify the Post- regimen experiment by doing and ISH at 10 dpr and determine whether there is a discrepancy between the number of Sox9-derived cells after the Pre- regimen and the number of Sox9+ cells as determined by ISH. According to the ISH shown in Figure 1 and Figure 1—figure supplement 2, there should be a major difference between the two which would justify that the authors utilise another approach. Since it is clear from the presented data that HH signalling is implicated in callus formation and in the downstream differentiation, the authors need to find an explanation for the similarity between the phenotype obtained after Pre- or Post- Smo ablation. At this stage, such mechanism is lacking. Are the Smo+ cells still present after the Pre- protocol the same ones (2/3) than the ones that activated Sox9 after resection? If yes, this would indicate that HH signalling is not implicated in the recruitment of Sox9 positive cells by the periosteum-derived population. The presence of Smo does not mean that the pathway is active. To check this, the authors should look at Ptc (as a sign of a response; maybe Gli could be used as well) and HH expression (to determine whether the signal is there or not). If Ptc and HH are normal, then they should find another reason explaining this. Thank you for resubmitting your work entitled "Sox9+ messenger cells orchestrate large-scale skeletal regeneration in the mammalian rib" for further consideration at eLife. Your revised article has been favorably evaluated by Marianne Bronner (Senior Editor), a Reviewing Editor, and three reviewers. The manuscript has been improved but there are some remaining issues that need to be addressed before acceptance. Specifically, the analysis of the Hh pathway is incomplete and this is a weakness of the paper. The authors have still not addressed the fact that the majority of the cells that co-express Col2a1 and Col1a1 are not Sox9 lineage. This is really important for the entire premise of the paper. In addition, there are other smaller points raised by the reviewers that you can see in the full reviews included below. This work still lacks an appropriate analysis of the Hh pathway at the time that the Sox9+ cells are initially stimulated in the periosteum. Since this is the model that is being put forth, it is necessary to show how/where this pathway is working at this early time point. While this was pointed out previously, the authors have done a very thorough job addressing the other concerns. It is confusing why this sentence: "Instead, Sox9-positive lineage cells require Hh signaling to stimulate neighboring cells to differentiation [sic-typo] into a skeletal cell type with dual properties of chondrocytes and osteoblasts" remains in the Abstract, since in the response to reviewers the authors state: "we conclude that Sox9+ cells are not likely to be emitting a second wave of Hh signaling.…" This seems at odds and could be made more clear. In subsection “Lineage tracing of Sox9-expressing cells to the regenerating rib callus”, the statement that "cells within the femur fracture callus expressed Col1a1 and Col2a1" needs to be modified to "some cells," because from the image it appears the vast majority of cells express one or the other of these genes, but not both. There are no negative controls shown to determine levels of background fluorescence. The authors have improved the manuscript, however I still have a major concern that remains unaddressed. If we compare 14 dpr PRE-induction schedule results in Figure 5A CONTROL and Figure 2C (which determine the contribution of Sox9 lineage at an early 14 dpr stage), then it seems that the majority of the cells that co-express Col2a1 and Col1a1 are not Sox9 lineage. This same concern I had pointed out earlier when I earlier said "cells are recruited from the region neighboring the injury site or from more distant cells". This is not been clarified in the discussion in the current version of the manuscript. This has further consequences if we now address the role of Hh signaling (compare Figure 5 PRE- and POST-induction schedule) in large-scale repair. In both PRE- and POST-induction schedule Smo mutants, none of the cells co-express Col2a1 and Col1a1; this suggests that the major contribution is from an altogether different source/ or an extended periosteum which was laid down post trauma/ etc. This point also needs attention. The authors have satisfactorily addressed the comments that were previously made. They have performed additional experiments and have re-written portions of the manuscript to accommodate my and other's comments. As a consequence, the quality of the study and of its conclusions have improved, which should be the purpose of the reviewing process. In my view, this study is now ready to be published in eLife. Although there are a number of studies published that claim to identify skeletal stem cells in mammalian systems, our study is the first to show, using genetic approaches, that a specific cell population (within the Sox9+ lineage) has a critical and required role in large-scale bone repair. We further provide evidence that this subpopulation coordinates repair by inducing neighboring cells to differentiate and build a bridging callus. To date the identification of a population that has this role in bone repair has never been described, thus we believe our study merits publication based on these novel findings. Determining and testing the mechanism by which Sox9+ lineage cells signal to other cells is a major project (ID signal, test genetically its requirement) and we determined that it would be out of scope for this initial publication. However, in our initial submission, we proposed the idea that the signal propagated by Sox9+ lineage cells was another round of Hh signaling. Thus, in our revised version we have followed-up to determine if this hypothesis is likely correct by examining when Hh ligands are expressed, if Sox9+ lineage cells release a Hh signal, and if neighboring cells showed evidence of having received and responded to a Hh signal. We used RNA in situ hybridization to detect the expression of Shh, Ihh, Gli2 and Ptch1 combined with Sox9+ lineage analysis. Based on these experiments we conclude that Sox9+ cells are not likely to be emitting a second wave of Hh signals and that they coordinate repair via some other to-be-identified non-autonomous mechanism. The data in support of this conclusion are now included in a new figure, Figure 3. In addition, we have now changed our thinking regarding the function of the Sox9+ lineage cells and this is reflected in completely revised portions of the discussion. After examining the location of Sox9+ lineage cells in relation to regions in the callus undergoing differentiation, Sox9+ cells appear dispersed and not likely to undergo differentiation prior to other neighboring cells in the callus. We have thus changed the title to reflect a role for these cells as critical “messengers” during the repair process rather than "pioneer" cells. We believe that the role of Hh in large-scale rib repair is distinct from its role during endochondral ossification. In the growth plate, Hh is required for proliferation of developing chondrocytes and for the maturation of osteoblasts into osteocytes. During rib repair we do not find evidence to support a role for Hh in proliferation. Instead, we provide evidence that Hh is required specifically in the Sox9+ lineage to stimulate their activity as messenger cells. Further, to address this concern, we now include results from a new Tamoxifen regimen in which we ablate Smo several days (3-5 dpr) after injury, to evaluate the role of Smo “Late” in differentiating callus cells. In agreement with Baht et al., 2014 although some delay in repair is evident, we see robust repair and bone formation at 14 dpr, while in contrast, removal of Smo earlier results in no repair at this stage. Thus, we believe that the critical requirement for Smo is early in repair. Furthermore, although bone production is somewhat delayed, our results support the idea that Smo is not strictly required for generating bone. In reviewing all the comments, it became clear that we did not adequately explain the design of our experiments and their rationale. We feel that this led to some confusion regarding how we arrived at our conclusions. To remedy this, we have re-written portions of the paper that describe the experimental set-up, particularly with regard to the different timings of tamoxifen administration and what cells are affected as a consequence. We have also used visual cues to orient the reader to the figures and we have completely re-written the legend to Figure 6 (model). We hope that these changes make the paper more accessible to both readers in and outside the field of regeneration biology. We agree that bone can repair quite well as evidenced by distraction osteogenesis treatments. What we meant to convey is that the skeleton does not naturally repair itself when there are very large injuries. In addition, the reviewer is correct to point out that not all bones have been tested for their ability to heal after large injuries. We believe that the repair seen in the rib is unprecedented in scale and considering this reviewer’s comments we have now changed the introductory text to focus specifically on large-scale repair (see Introduction, paragraph one). We now realize that we need to be more explicit about our experimental design. In our study, we show the outcome of two different tamoxifen regimens. When induction occurs prior to injury we observe that only some cells in the callus are derived from a population that expressed Sox9 prior to injury. This observation is indeed supported by He et al., 2017 where the Sox9-expressing cells are also labelled with Tamoxifen injection prior to injury. Indeed we are grateful for Xinjun He for sharing the results of his experiments prior to publication (downstairs from us) and his results led us to use a similar Sox9-Cre strategy. Similar to our Figure 2C, if the panels of Figure 4 of He et al., 2017 are enlarged, it is clear that there are many callus cells that do NOT carry the tdTomato lineage trace indicating that they are derived from other sources that did not express Sox9 prior to injury. Although most cells express Sox9 in the callus as seen by RNA in situ hybridization (our Figure 1B) and by immunofluorescence for Sox9 protein expression (Figure 4, He et al) this just shows that Sox9 can be upregulated after injury, not that these cells are necessarily a special population. Additionally, it is known from other studies that other, non-Sox9 expressing lineages contribute to bone repair such as Pax7-expressing cells from muscle (PMID: 25594525). In our Figure 2E, we perform a very different experiment than in Figure 4 of He et al., where we induce recombination of the tdTomato reporter before and after injury. This will capture both the cells that expressed Sox9 prior to injury and the cells the express Sox9 in response to injury. Thus there are many more cells labelled. At later time points it is true that many cells (~85%) come from the lineage of cells that were expressing Sox9. However, upon careful examination, there are some cells (~22%) that are not marked by the tdTomato reporter, indicating that they may come from a lineage that never expressed Sox9 prior to Tamoxifen induction. In response to these comments, we have made significant alterations to our text in subsection “The murine rib bone regenerates through a hybrid skeletal cell type” to better explain these two results and used visual cues in the figures (see Figure 2) to better distinguish between the two different types of experiments. In our previous publication (Tripuraneni et al., 2015, PMID 25651082, Figure 2B’), we showed that no healing occurs when both the bone and periosteum are removed (2 months post healing). Instead interstitial connective tissue forms with no cartilage or bone evident. In response to this comment, we also examined healing at an earlier time point (7 dpr) when normally cartilage would be evident and saw no cartilage formation (Figure 2—figure supplement 1). We then examined Sox9/Runx2 expression and did not see an abundance of double positive cells. Thus, we believe that in the absence of the periosteum, early osteochondral progenitors are not present and do not differentiate into cartilage or bone tissue. It is well-known that Col1 production diminishes significantly as osteocytes mature, so we do not expect to see high expression in these cells. However osteoblasts and new osteocytes express Col1 and this is evident in Figure 1D, Figure 1—figure supplement 2, and Figure 5A. To illustrate this more clearly, we have adjusted the area enlarged for Figure 5A which clearly shows cells embedded in matrix expressing Col1 (marked with arrowheads). We believe that callus cells express cartilage and bone genes in a similar sequence to developing cartilage and bone cells. We do observe co-expression of Col10 with Col1 RNA (data not shown) and we also observe expression of both the chondrocyte Col10mcherry reporter and the osteoblast specific reporter (Col1(2.3) GFP). This is now shown in Figure 1E. We also see expression of Shh early in the repair callus of the rib as previously reported. A reference to Matsumoto et al. is now included and our data in support has been added to Figure 3A, C.
Where is Shh, Ihh, Ptc expressed prior to chondrocyte differentiation? It seems this is a key piece of data that is missing. Instead Figure 3 shows expression of these genes in the chondrocytes. However, knock-out of Smoothened affects an earlier stage of healing. We now include our data examining the expression of Shh, Ihh, Gli2, and Ptch1 when cells are in the process of differentiation in Figure 3A, C and Figure 2—figure supplement 1A, C.
Work by Baht has already shown that Hedgehog signaling is dispensable during expansion of the cartilage in the callus. Thus, there is a disconnect between the expression patterns of Shh, Ihh, Smo, and Ptc, and the experimental data. We do not know why in Baht et al. the cartilage callus still forms. One possibility is that the Smo KO is not actually complete (no confirmation is shown and at least for the Col2Cre line, we have been unsuccessful in obtaining recombination from this transgene during repair). Another idea is that there are differing requirements for Hh signaling depending on the type of injury (fracture vs. large-scale repair). We now include these ideas in the Discussion section (fourth paragraph). We also now include all the expression patterns to show the activity of the Hh pathway early in repair (see response to comment 8). One of the most interesting results from our work is that the KO of Smo in a small population that expresses Sox9 prior to injury (this population only contributes to a minority of the callus) results in a severe phenotype (no healing). These are the results we wished to highlight and explain in the model diagram. We hypothesize that these Sox9+ lineage cells are important coordinators of repair and influence neighboring cells through non-autonomous mechanisms to adopt a hybrid cartilage/bone character. These neighboring cells may have originated from the periosteum but not from the subpopulation that expressed Sox9 prior to injury and so many of them are not depicted in red in the model diagram (matching our lineage tracing results in Figure 2C). Under the influence of signals from the Sox9+ lineage cells, we propose that these neighboring non-Sox9+ lineage cells differentiate, adopt a hybrid cartilage/bone character, and build a bridging callus. We realize our original description was perhaps not clear, and we have now added more a detailed explanation in the legend to a revised Figure 6. Figures 2 and Supplemental 2 should be combined. It is difficult to compare the location of the images when the histology and in situs are in separate figures. We have now done as suggested. We now include additional evidence with immunofluorescence for COL1 and COL2 in Figure 1—figure supplement 1D. We also now include an experiment using two transgenes that mark hypertrophic chondrocytes (Col10a1-mCherry) and osteoblasts (Col1(2.3)-GFP) in Figure 1E. Both methods show results consistent with our RNA-ISH results. This reviewer makes the excellent point that it is possible that only a subset of the Sox9+ lineage population (already only ~6% of the periosteum) are the critical players. We have acknowledged this possibility in the Discussion (paragraph two). Further experiments will need to be done to determine if there are subgroups within the Sox9+ population that have a higher healing potential. Unfortunately, the tools to address this question are not available and we feel it is reasonable at this time to conclude that Sox9 expression is so far our best indicator of a cell type in the periosteum that is critical for large-scale rib repair. We are not sure which experiment this question is referring to (Pre or Post regimen). Considering our Pre experiment, we cannot definitively determine if most Sox9+ lineage cells come from a region neighboring the injury site or from a more distant location without doing real-time in vivo imaging. We hypothesize that most arise from the nearby periosteum, since without the periosteum, repair fails (Tripuraneni et al., 2015 and Figure 2—figure supplement 1). Previous lineage tracing experiments have shown that the majority of the callus comes the periosteum (example: Colnot, 2009). We also now show that when the periosteum is removed along with the rib bone, there is a failure to build a callus (Figure 2—figure supplement 1). Together these results indicate that the periosteum is a main source of cells in the callus. With help from Dr. Jay Lieberman’s lab we have now added a comparison to the femur which has more limited repair capacity. We find that the number of Sox9+ cells in this bone, either before and after fracture is not significantly different from our findings in the rib. These results are shown in Figure 2—figure supplement 2A. Thus some other property either intrinsic to the cells or related to their environment may explain differences in repair capacity. Based on this interesting question we have carried out further analysis in both controls and Smo KO animals looking at target gene expression. Interestingly, we still see strong Shh expression early in Smo KO animals in many cells across the callus (Figure 3C). Neither Shh nor Ihh expression could be found specifically or particularly strongly expressed in Tdtomato+ cells (there is some minor overlap). Thus the characteristics of the population that releases a Hh signal is yet to be determined. In addition, we believe that the expression of Ihh and Shh later in chondrocytes is more reflective of their advanced differentiation and perhaps a role in promoting osteocyte maturation rather than in stimulating Sox9+ cells to mediate repair. Indeed using an additional new experimental tamoxifen regimen now added to the paper, “Late” Smo KO (strictly after injury) we did not observe a dramatic effect on repair (some delay evident but complete bridging still occurs), Figure 5—figure supplement 1. Additionally, in control animals, we did not find that cells nearby Tdtomato+ cells had higher Ptch1 or Gli2 expression, Figure 3C and Figure 3—figure supplement 1A, C. All together, these results suggest that in contrast to our initial hypothesis, the predominant orchestrating signal released by the Sox9+ cells is not a HH ligand. Some of these ideas are now included in the discussion. Although Hh signaling is known to have a role in endochondral ossification (specifically controlling cartilage cell proliferation, Long et al., 2001) we argue that its most important role in regeneration is distinct in inducing the Sox9+ lineage cells to become messenger cells that coordinate repair by inducing neighboring cells to differentiate into cartilage/bone hybrid cells that mediate the repair process. We have replaced the word “unique” and with the word “distinct” to be more accurate. Thanks for this comment, we completely re-worked the Introduction with the aim of making it more readable to a broader audience. We initially called these cells “pioneer “cells because we thought they might migrate in first, and they appeared to lead the repair process by both differentiating and also emitting a differentiation signal. However, based on experiments suggested by the reviewers, we now believe, that while they may migrate in early, they don’t appear to be the first to differentiate (Figure 3—figure supplement 1B). We have therefore changed the term to “messenger” to illustrate their important coordinating and orchestrating role. We used the term “hybrid” because the cells express typical cartilage- and bone-specific genes simultaneously. The term “bi-potent” implies that they will differentiate into either bone OR cartilage and in this repair context, we believe the fate of the cells is predominantly osteocytes. We could not think of a suitable substitute word. Thus, to make sure there is no confusion, we have carefully defined the term and continue to qualify it using the word “osteochondral” throughout the manuscript. We have now made large changes to the text which should help clarify the different outcomes (subsection “Lineage tracing of Sox9-expressing cells to the regenerating rib callus”). We have now added insets as recommended. Some ISH data are a little confusing. First, they are done at different times: 5 dpr in Figure 1 and 7 dpr in Figure 1—figure supplement 1. Adding to the confusion is the fact that the lineage analyses are started at 10 dpr, such that it is difficult to compare ISH and lineage analyses. Our goal was to show that cells with dual cartilage/bone properties persist throughout the repair process. We could show earlier lineage analysis but couldn’t determine how this would add to the study. Instead we hope that some new phrasing of the text (2nd paragraph of the results) helps with understanding the data. Second, the Sox9 fluorescent ISH indicates that just about all cells of the callus are positive (Figure 1 —figure supplement 1A), while a small proportion of them are positive using a colorimetric approach (Figure 1—figure supplement 2). Could you comment this discrepancy? In general, we and others have found that the colorimetric assay is less sensitive than the fluorescent one. Additionally, although the sequence of events during repair is highly reproducible, we do see some variation in timing. Thus, although both samples are shown at 7 dpr, the repair callus in Figure 1—figure supplement 2 may be slightly more mature than the callus in Figure 1—figure supplement 1A. We agree that the experiment suggested by the reviewer is better way to determine if Sox9 is upregulated after injury and thus the justification outlined in the text for the “Post” experiment doesn’t work. We have now changed the lead-in to this section of the paper. We believe that there is no difference in phenotypic outcome between the Pre and Post Smo ablation because the Sox9+ lineage population is the key cell type that requires Hh signaling. Both Tamoxifen regimens would result this subpopulation being null for Smo KO. Based on both these outcomes we hypothesize that in response to Hh signaling, Sox9+ lineage cells produce a second differentiation signal that induces neighboring cells to differentiate into the cartilage repair callus. We have now improved the text describing these ideas in the discussion and in the legend to model Figure 6. Yes, the cells expressing Smo likely also express Sox9 after resection since both are broadly expressed throughout. We did not mean to imply that Hh signaling is involved in the physical recruitment or migration of the cells. Our hypothesis is that Sox9+ lineage cells require Hh signaling in order to produce another signal (to be identified) that induces the differentiation of neighboring cells (including those expressing Smo and Sox9 after injury). We have made this idea clearer in the Discussion text (last paragraph) and the legend of Figure 6. Thank you for these suggestions. We have added expression data on Ptch1 and Gli2, as read-outs of Hh signaling, Figure 3C and Figure 3—figure supplement 1A, C We still see strong Shh expression early in Smo KO animals in many cells across the callus (Figure 3C). Neither Shh nor Ihh expression could be found specifically or particularly strongly expressed in Tdtomato+ cells. Additionally, in control animals, we did not find that cells nearby Tdtomato+ cells had higher Ptch1 or Gli2 expression, Figure 3C and Figure 3—figure supplement 1C. In summary these results suggest that the predominant signal released by the Sox9+ cells is not a HH ligand. These ideas are now included in the discussion. We now include analysis at 3 dpr (Figure 3—figure supplement 1A) showing that Sox9+ cells in the periosteum express the Hh pathway readout, Ptc1. We believe that Sox9+ cells respond to Hh signaling while they are still in this peripheral location. As they migrate into the callus their necessity to respond to Hh appears to decline. We have now changed the Abstract to make it more clear that we think the second wave of signaling is not yet known. We have now changed the text to be more conservative to say “some” as recommended. The authors have improved the manuscript, however I still have a major concern that remains unaddressed. If we compare 14 dpr PRE-induction schedule results in Figure 5A CONTROL and Figure 2C (which determine the contribution of Sox9 lineage at an early 14 dpr stage), then it seems that the majority of the cells that co-express Col2a1 and Col1a1 are not Sox9 lineage. This same concern I had pointed out earlier when I earlier said "cells are recruited from the region neighboring the injury site or from more distant cells". This is not been clarified in the discussion in the current version of the manuscript. This is indeed correct and a point that is very important in the paper. We believe that Sox9 lineage cells emit a yet-to-be identified signal that induces neighboring cells to participate in building the callus and to start expressing differentiation genes of cartilage and bone. We have now included additional text throughout the manuscript to drive-home this point. This has further consequences if we now address the role of Hh signaling (compare Figure 5 PRE- and POST-induction schedule) in large-scale repair. In both PRE- and POST-induction schedule Smo mutants, none of the cells co-express Col2a1 and Col1a1; this suggests that the major contribution is from an altogether different source/ or an extended periosteum which was laid down post trauma/ etc. This point also needs attention. Yes, the majority of the cells that build the callus must come from somewhere else. We believe they mainly come from the non-Sox9 lineage populations in the periosteum but could ostensibly come from a variety of sources. We have now included this idea in the Discussion. To address this issue, the authors might want to revisit the Sox9CreERT2 lineage tracing. The percentage contribution can be determined for 10, 14 and 21 dpr for both PRE- and POST- induction schedule. After the bony callus is made there is a remodeling phase where bone is degraded and replaced. At 14 dpr, remodeling has begun and many of the tdTomato cells are beginning to be remodeled out. This was also observed post-fracture by He et al., 2017 (comparing 9 days to 2 months post-femur fracture in Figures 4 and 5). We now include this idea in the manuscript. To avoid confusion, we have now moved the images of the older samples to supplemental as the point they were intended to make— that there is longer-term contribution of Sox9-lineage cells with osteocyte-like morphology (hence the higher magnification) to the repair site— is tangential to the paper, and has also already been shown post-femur fracture by He et al., 2017, Figure 5. We thank Andy P McMahon, Yang Chai, and Baruch Frenkel for advice and comments on the manuscript, Xinjun He for sharing results before publication, Drs. H Akiyama and P Maye for sharing mouse lines, and Ashlie Muñoz, Simone Schindler, Sophia Bougioukli for technical assistance. Funding was from the National Institutes of Health [T32 HD060549 to STK, R21 DE023899 and R35 DE027550 to JGC; R21 AR064462 and R01 AR069700 to FVM]; the James H Zumberge Research and Innovation Fund to FVM; and a University of Southern California Regenerative Medicine Initiative Award to FVM, JGC, and JRL. Animal experimentation: This study was performed in strict accordance with the recommendations in the Guide for the Care and Use of Laboratory Animals of the National Institutes of Health. All of the animals were handled according to approved institutional animal care and use committee (IACUC) protocols (#11256 and #20639) of the University of Southern California. © 2019, Kuwahara et al.